We recently returned from our fall break to Orlando where we spent time at both Walt Disney World and Universal Studios Orlando. 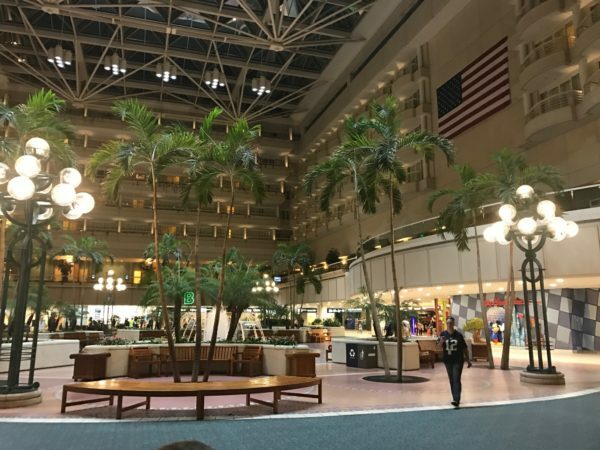 I had heard from many of you readers that Orlando International is one place where TSA PreCheck comes in very handy. I have personally been in crazy long security lines there returning to Indianapolis. But surprisingly, there was no line either in TSA PreCheck or in the regular security line when we went through about noon on a Tuesday! Now, we do usually book our flights when it requires the least Rapid Rewards points to fly, which also tends to be when the fewest people are flying (that’s why the points are low), so that is likely a big contributor here. Tuesdays and Wednesdays are usually slower days to fly. So, since we have gotten TSA PreCheck it really has only helped us at Denver International, where it was a HUGE help with a long line there. Otherwise, at La Guardia there was no PreCheck line and leaving from Indianapolis there has never really been much of a line. We laughed when we left Indy for Florida because the PreCheck line was actually slightly longer than the regular security line! I think the government has sold a ton of TSA PreChecks, so I think we may see longer lines there with new people joining the fold. Plus, the government has been working hard over the last few months to reduce long security lines. So those two things combined, I believe, is why we have not seen a huge net benefit using TSA PreCheck across three airports. But it is still handy not to have to remove our computers or take off our shoes. It definitely is expedited and it feels good to know if there is a long security line we have a way of bypassing it. Well, first off, I’m not trying to make the PreCheck lines any longer for myself, but there are some folks for whom the service makes a great deal of sense. We fly more than most people, both for international trips and mostly via SWA to visit grandchildren (and a big thank-you for the companion pass! ), so the PreCheck fee is some of the best money we spent. Our mistake was getting the PreCheck first and a year later adding the Global Entry, which includes PreCheck without additional cost…lesson learned. I agree that sometimes the PreCheck line is only a few minutes faster than the regular line, but keeping my shoes, jacket and hat on is a real bonus. Then there are the times when the regular line extends around the corner and so many people just can’t seem to understand simple instructions to keep the line moving. With the PreCheck line, people are knowledgeable about the procedures and it flows much more smoothly. If you want to compare the two, try flying out of LaGuardia, which doesn’t have PreCheck…what a nightmare that is. When you do the math, even only flying three or four times a year, for me it’s a good deal. Flying infrequently might be reason enough to skip the service. Great insight! Thanks so much for sharing!